Sponsored by the US taxpayer. American goods for sale on Kabul shelves. KABUL, Afghanistan — First came the Brezhnev Market. Then the Bush Market. Now Afghans are beginning to call their notorious bazaar full of chow and supplies bought or stolen from the vast U.S. military bases by the name of the current American president, a modest counterweight to his Nobel Peace Prize. Well, maybe not quite yet. Most of the shopkeepers and customers still call it the Bush Market, but several said that the new name is gradually gaining traction. The small market, tucked behind a commercial building in the northwest side of the city, is a U.S. taxpayer’s nightmare. In front of Tor’s shop was a nearly waist-high, three-deep wall of boxed food that apparently had been destined for military chow halls. There were cases of pre-cooked cheddar gravy sausage biscuits (forbidden to Muslims, who don’t eat pork), and dozens of flats of the Otis Spunkmeyer muffins and white chocolate macadamia cookies that soldiers often get at mealtime. “I myself like the cookies and cakes,” Tor said. Inside, two assistants were stacking hundreds of bottles onto a wall of shelves full of Gatorade. Shelves on the other walls were jammed with Quaker Instant Grits, Aunt Jemima syrup, McCormick spices and the giant cans of vegetables used in chow halls. 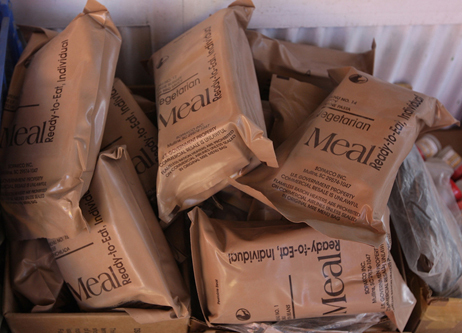 All around were stalls offering cases of MREs (meals-ready-to-eat), new-in-the-box military cots and goods usually sold on base stores, such as American-made shampoo, military ID holders and the huge plastic jars of the food supplements used by bodybuilders. One shop offered an expensive military-issue sleeping bag, tactical goggles like those used by U.S. troops and a stack of plastic footlockers, including one stenciled “Campbell G Co. 10th Mtn Div.” Another had a sophisticated “red-dot” optical rifle sight of a kind often used by soldiers and contractors. Some of the items for sale were knock-offs of military boots and packs, and some of the food is past its expiration date. Tor’s muffin boxes said they were no good after March 9, 2009. 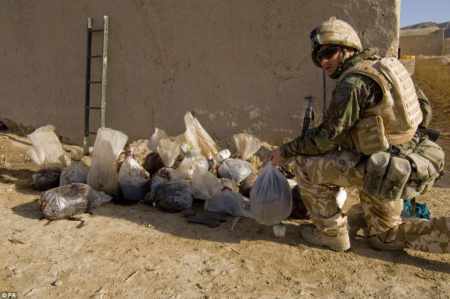 Many of the goods, though, are supplies that were intended for American troops — it’s hard to deny the origins of MREs, for example — and in good condition. Most apparently originate at the giant Bagram air base north of Kabul, where there’s a similar market just outside the base. The precise route the stuff takes to market, though, isn’t clear, at least if you ask the shopkeepers. 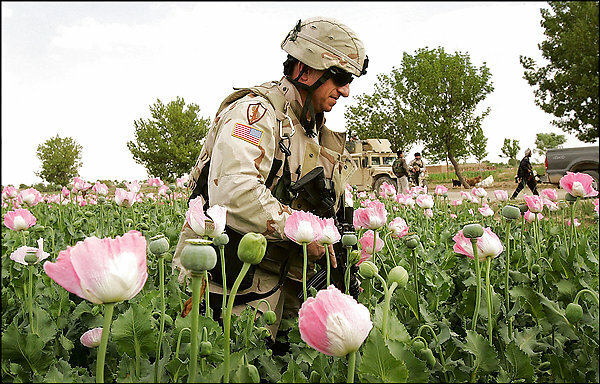 NATO officials know about the market, and an ISAF spokesman, Capt. Mike Andrews, said that if any sensitive equipment turned up for sale, security forces would take action. He declined to say whether anyone regular checks the market. “Our guys go out for a lot of different things, but for security reasons I can’t really talk about what they do,” he said. The shopkeeper offering the sleeping bag and knock-offs of clothes favored by security contractors said he bought some things from the sister market in Bagram. Across the way, Wahed Wahedzada was sitting behind the counter of a shop that sells disposable dishes and eating utensils. 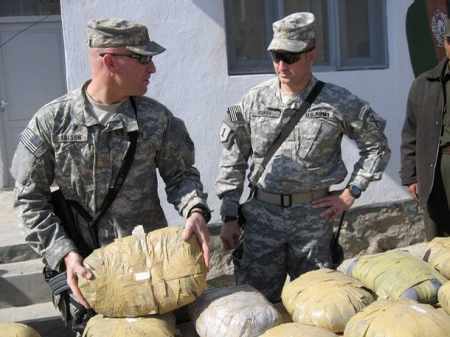 “People who work on Bagram sell it to people who sell it to us,” he said. Then his boss, too, jumped in to correct him. “No, Maybe of 100 items I have, only two or three are American,” said Muhamed Qauem, 35, who then gave a version of the party line in several of the shops; that most of the goods are cheap Chinese-made items and the shopkeepers buy a few things from Bagram as bait to lure customers.